Effective customer service training covers more than niceties. Organizational profitability is threatened when staff are unable to manage customer needs. Yet it takes more than soft skills training to turn these situations around. 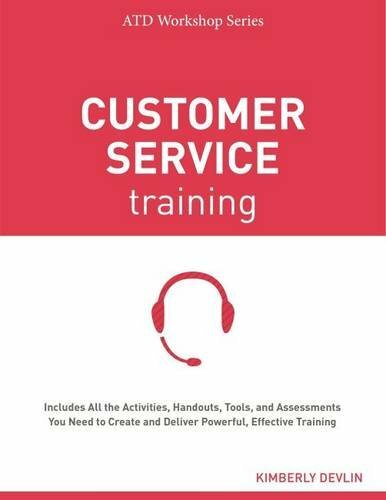 A great customer service training covers essential behaviors, service strategies, and service systems that together ensure an exceptional customer experience. Training authority Kimberly Devlin presents two-day, one-day, and half-day workshops that support trainees in any industry and environment, not just the call center. Each workshop introduces techniques for managing challenging customers and situations and also offers opportunities to apply new skills to service interactions. The free, ready-to-use workshop materials (PDF) that accompany this book include downloadable presentation materials, agendas, handouts, assessments, and tools. All workshop program materials, including MS Office PowerPoint presentations and MS Word handouts, may be customized for an additional licensing fee. Browse the licensing options in the Custom Material License pricing menu. The ATD Workshop Series is written for trainers by trainers, because no one knows workshops as well as the practitioners who have done it all. Each publication weaves in today's technology and accessibility considerations and provides a wealth of new content that can be used to create a training experience like no other. The series also includes Communication Skills Training, Leadership Training, Coaching Training, and New Supervisor Training.